Please refer to our stock # TR710 when inquiring. You can own this classic Tiffany engagement ring for a reasonable price. The ring is set with a 0.31Ct brilliant cut diamond that has H color and VVS1 clarity. 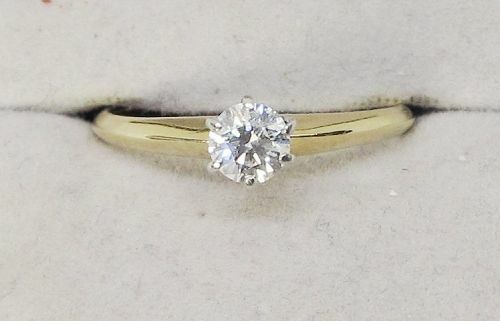 The setting is made with an 18Kt yellow gold shank and platinum prongs. The fully hallmarked ring is a size 6 ¼ and it can easily be sized.